Can farming become decentralized—just like solar power? Urban agriculture has the potential to change the way we eat and farm, and to revolutionize our relationship with the food on our plate. Migrating sustainable agriculture closer to customers addresses a laundry list of looming concerns, including trucking, water, energy costs, carbon emissions, and pesticides. Instead of pesticide-intensive factory farms, we can envision organic foods grown in Brooklyn greenhouses. Instead of concentrated animal feeding operation (CAFOs), think backyard chicken coops. What about using technology like LEDs to provide indoor growth environments or growing food vertically instead of using precious urban real estate? Why not grow vegetables in greenhouses on roofs in Manhattan or Mumbai? Demand for food is rising, particularly in rapidly growing economies like China and India; fossil fuel-based fertilizers are getting more expensive; and water is an increasingly scarce resource. Almost a billion people in developing countries are undernourished, according to the Food and Agriculture Organization (FAO). Why not grow food vertically? AeroFarm is a startup that looks to do just that. With a modest amount of land, plus water and electricity, AeroFarm claims that it can grow greens at the same cost as traditional farming areas in California. Yields are likely modest but it's a novel solution for city dwellers if the energy balance is favorable. New York's Gotham Greens builds rooftop greenhouses that combine advanced horticultural and engineering techniques to optimize crop production, crop quality, and production efficiency. Their climate-controlled facility can grow produce year-round. 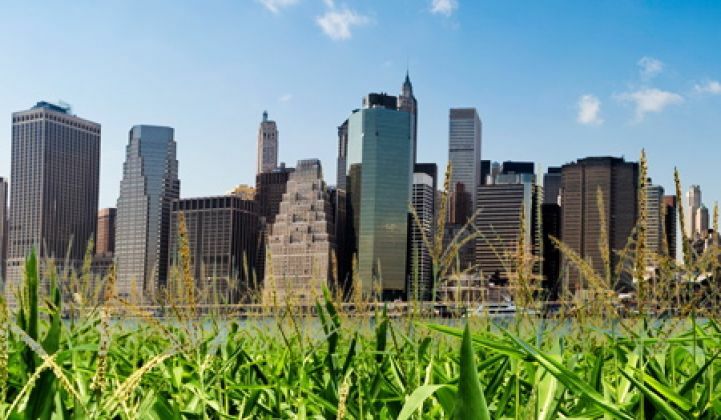 Venture capitalists are paying close attention to the green agriculture market and will certainly look at urban farming if the market potential exists. Recent VC investments in green agriculture include WeatherBill (with investment from Google Ventures and Khosla Ventures), as well as startups AgraQuest, Yulex, and Holganix. Aquaponics can produce fresh fish and vegetables year-round, with a combination of aquaculture and hydroponics in an integrated, soil-less system. In these systems, fish waste fertilizes plants, while plants naturally filter water for fish. Aeroponic farming uses mist to grow plants without soil, another-urban friendly farming technique. And urban agriculture has the potential to provide jobs and strengthen communities while producing affordable food. Will Allen, a farmer who produced a quarter of a million dollars worth of food on two acres in Milwaukee, won a $500,000 genius award from the MacArthur Foundation in 2008 for his urban efforts. First Lady Michelle Obama is planting an organic garden on the White House lawn and the President is touting urban agriculture as a means to revitalize cities. Can tomorrow’s farmer be an urban entrepreneur with a greentech thumb?